Across the globe, there are over 3 billion users on social media. Competition is fierce. 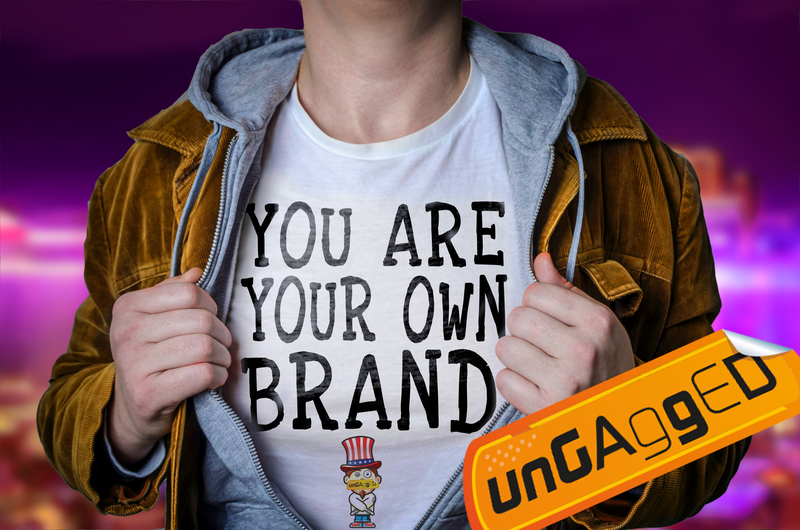 So knowing how to brand yourself and your business for social media is crucial if you want to set yourself apart in the digital world. Building your brand has to be part of your social media strategy. It’s all well and good to share your story, but you need to make people pay attention. By creating a tangible brand, you are creating the opportunity for brand loyalty. But how, exactly, do you do that? We’ve put together 5 tips on how to brand yourself for social media results. You’ve no doubt spent a chunk of time figuring out your niche and building an identity for your company. Great, now it’s time to tell everyone about it. Your social media presence needs to reflect your business: it needs to showcase your ethos, your mission statement and your goals. Next, you need to define your visual identity. What colour should people associate with your brand? Are you playful and bright or serious and sombre? If you don’t know, your customers won’t either, so choose a visual palette and stick to it. But it doesn’t stop there. A solid brand identity is all about the details. What filter do you use on your Instagram posts? How are your photographs lit? What image overlays do you use? What genre of music do you use for your video content? Have you got the same username on Twitter, Instagram and Facebook? If you don’t have a definitive answer to these questions, you need to lock down your brand in a lot more detail. GAP have got their visual identity nailed. 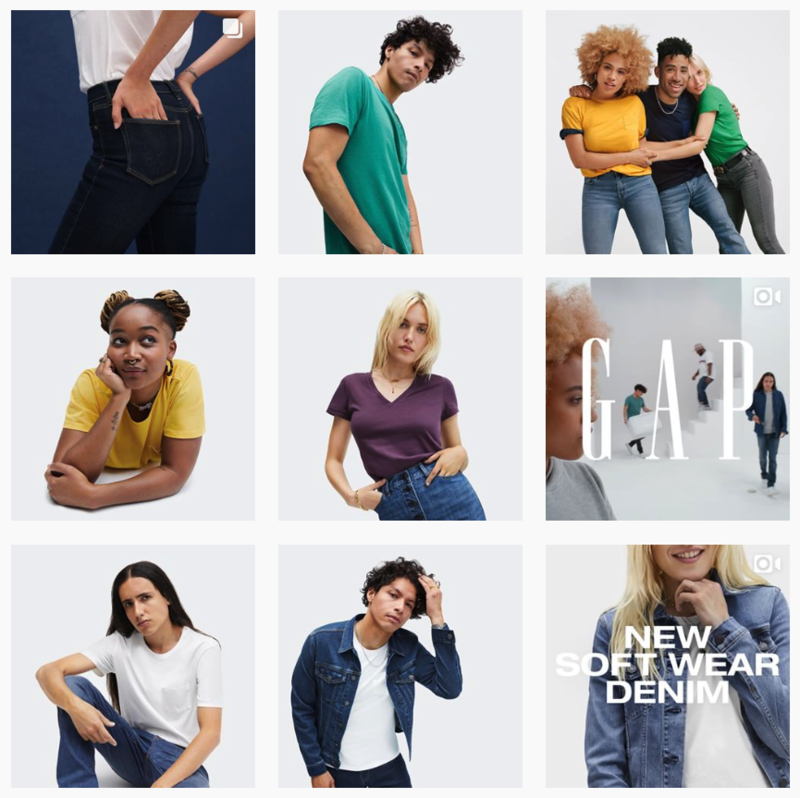 Even without the logo, you’d be able to guess this was GAP’s Instagram feed, based on the clean, plain background, the font they use, the clothes themselves and the models they feature. They have a distinct visual identity. Once you’ve defined who you are as a company, you’ve got to stick to your guns. Any brand identity without authenticity is worth exactly nada. Zilch. You are a pro in your niche, right? That’s why your business exists, after all. So prove it. Share content that earns you a place at the table. Play to your strengths and talk about the things that are relevant to your industry. Don’t just post for the sake of it. Yes it’s important that you post regularly, but if you post any old thing, it will do more harm than good. Nail down your themes and keep your strategy strict. Consistency is key, across all of your content and all of your channels. Once you’ve reigned yourself in and focused on only what is relevant, you’ve got to think about how you are speaking to your followers. Honing the tone of voice for your brand can be particularly challenging. Here’s an exercise to make your life easier; write a list of every adjective that describes your brand. Everything you can think of, the more the merrier. Good. Now cut that list in half. And again. Keep cutting this list down until you have four words left, the four that are core to your brand. Those four words steer your tone of voice. So is your business brash, bold, sarcastic and outspoken? How about kooky, friendly, conscientious and optimistic? Whatever words you choose, they will become the touchpoint for every tweet, post and caption you write on social media. Ask yourself if your writing consistently marries up to those four words and you’ve got yourself a tone of voice. There are a few big brands out there who are smashing their tone of voice. 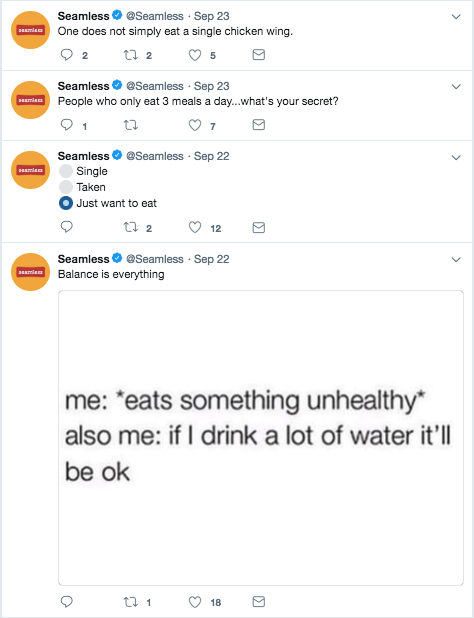 We’ve all heard about the hilarious tweets from Wendy’s, but have you seen Seamless on Twitter? They are an online food ordering service, and they are just as entertaining. All of their tweets tie in seamlessly (see what I did there?) with their audience. By using memes and references their demographic will connect with, they are putting their brand at the forefront. Sometimes social media can feel like a digital version of shouting into an abyss. With so many businesses and influencers dominating the game, how on earth do you make sure your brand stands out? You’ve got to engage with your audience. Whatever channel your demographic lends itself to, your social media presence should be about conversations, not just showboating. Once you’ve got that down pat, it’s time for interactive content, and thankfully, it’s becoming easier than ever. Facebook and Twitter have had poll functionality for a while, but Instagram has recently joined the fray with their polls and Q&A tool. You can use your Instagram stories to ask your audience questions or flip it to an AMA style approach. People love it when they feel like they are being heard, so give them the chance to reach out to you and make sure you respond! There’s also IGTV, so the 10 second limitation on Instagram stories doesn’t have to hold you back any more. Branch out, either live or recorded and give your audience something to react to. There are a bunch of tools out there to help you engage with your audience, so you’ve got no excuse not to! So you’ve found your niche, developed your brand name, and gained a loyal band of followers. It doesn’t stop there. You’ve got to keep an eye on how the channels are evolving and changing, pay attention to what your audience is actually responding well to, stay agile and keep your presence fresh. If you don’t keep up with the game, building that brand identity has all been for nothing. If that’s whet your appetite, you’re going to want to get yourself to Dennis Yu’s Facebook masterclass on 7 November. He’s going to be delving into how Fortune 100 brands use their social ad strategy, and he’ll show you how to do exactly the same, no matter what your budget.